After these past several field trips in the rain, my Nature Vancouver group and I almost felt like we deserved today: look at that sky! It wasn’t warm, barely above freezing most of the day, but irresistibly beautiful all the same at Vanier Park and on the shores of English Bay. 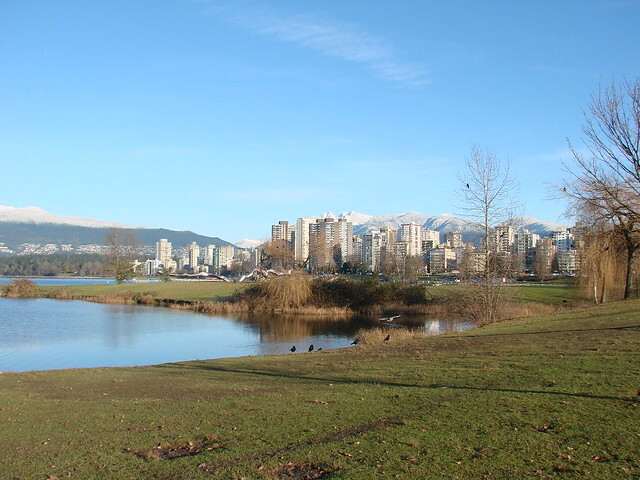 As you might expect in Vancouver in December, our morning’s list was heavily weighted towards waterfowl. Of our 36 species, fully fifteen and a half were anatids, among them some local specialties. 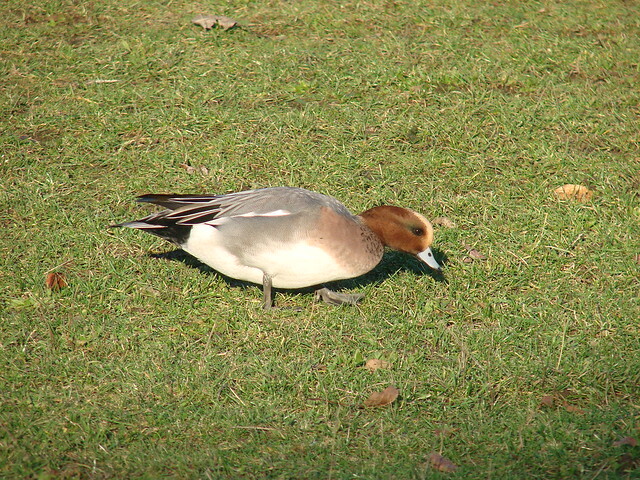 The little pond at Vanier Park produced the expected Eurasian Wigeon; there was general agreement that this male rather outshines the females we’d been watching on the last couple of trips to Jericho! The Canada Goose flock, a bit standoffish of late, finally stood still to let us scan it; the results included two other species of goose, a single juvenile Snow Goose and this lovely minima Cackling Goose. 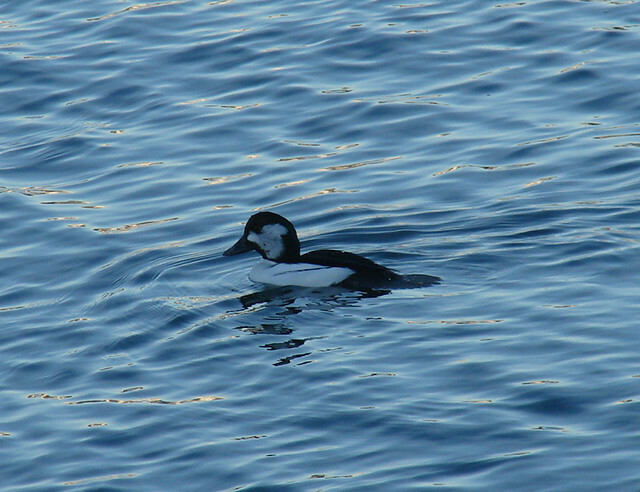 And the rarest bird of the day was the reliable little Bucephala hybrid, bobbing and diving more or less on his own in the vicinity of the Surf and White-winged Scoters. Click for a dizzying video. 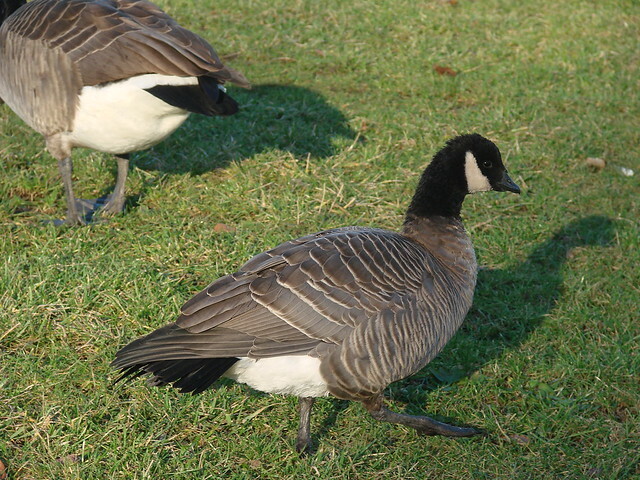 Both birds were brown, but one–the right-hand bird in the photo above–showed a solid black bill and a yellow eye, sexing it a male; closer inspection revealed a decided ruddy tone to many feathers of the flank. The molts of Northern Shoveler remain something of a mystery, but this is apparently a first-cycle male at the very dullest extreme, easily overlooked in a first scan, but a real eye-opener if you pause to look close. Again and again it strikes me how much Jericho Beach reminds me of Mount Auburn–without the dead bodies, of course, and with a much better gull selection. I don’t have my lists at hand, but I’m pretty much certain that my larid list for the Massachusetts cemetery comprises three species: Great Black-backed, American Herring, and Ring-billed Gulls. 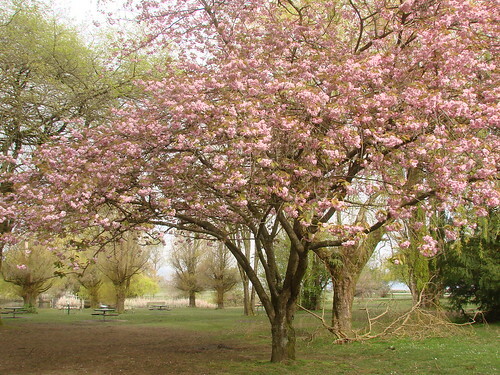 Without any of those three, this morning’s Jericho Beach walk produced four species. Four species–depending on how you count ’em. Sooner or later I’m going to have to come to terms with the pugetensis problem. 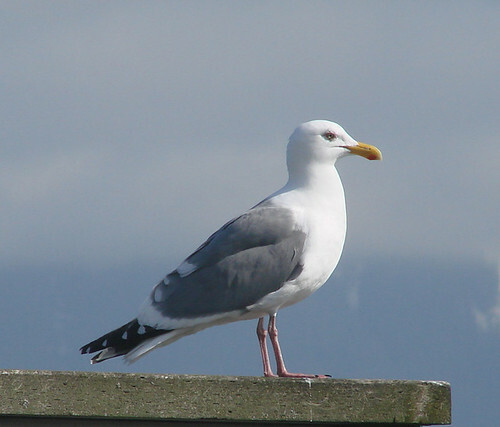 Our most abundant gull here in Vancouver is Glaucous-winged Gull, or at least birds that look more or less like Glaucous-winged, with pale upperparts and blue-gray wingtips (whence the name). 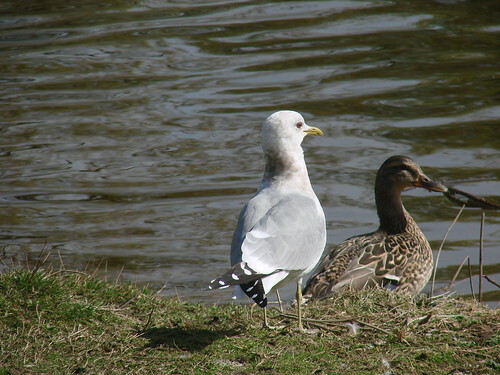 An awful lot of those birds, however, have wingtips that are slightly too dark for a classic Glaucous-wing, suggesting that somewhere on not too high a branch in their family tree perches an American Herring or Western Gull. Some of them have primaries so sooty as even to be mistaken for one of those species. I try to look at such birds when I can, but until this morning hadn’t run across anything overly convincing. 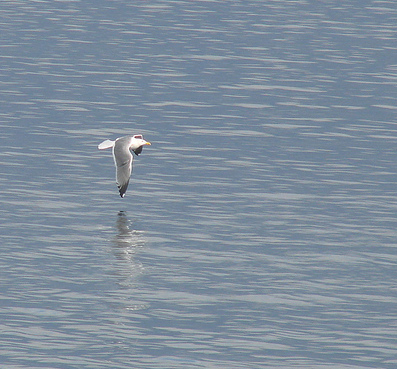 Then, while I was watching my first Bonaparte’s Gulls of the spring off the beach, in came this beauty. 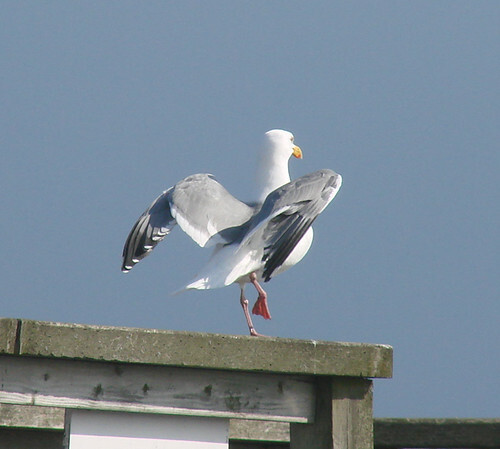 When it landed on the pier–in less than ideal light, unfortunately–the dark upperparts and broad secondary “skirt” were obvious. Those features plus the black wingtip and very bright bill left me satisfied that if this wasn’t a pure Western Gull, then it was at least so near the dark end of the hybrid spectrum as to make its mixed ancestry undetectible. The bird was aggressive, and I had some excellent comparative views of its upperpart color with the paler mantles of the Glaucous-wings in flight; this, sadly, is the best photo I got of the combination. And the day’s fourth gull species? 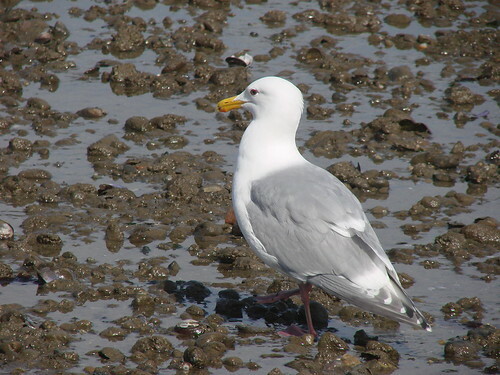 No surprises there: Mew Gull. There are relatively few around right now, but one fine adult was on the first pond with the ducks. I especially like this picture and the way it shows the smudgy “shawl” on the hindneck, already lost at this time of year on most adult Mew Gulls. 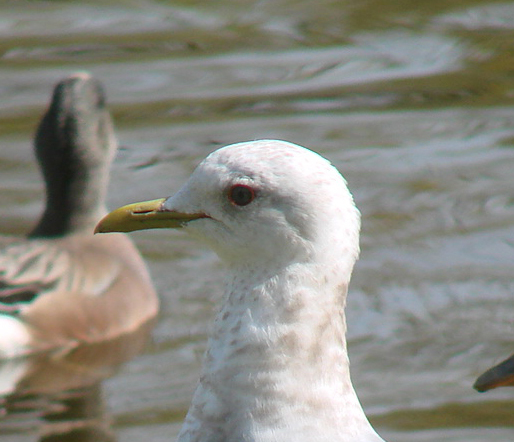 I still don’t have a handle at all on distinguishing these “Short-billed” Gulls from Common and Kamchatka Gulls, though apparently the pale eye is a good indication that I didn’t miss a major vagrant. 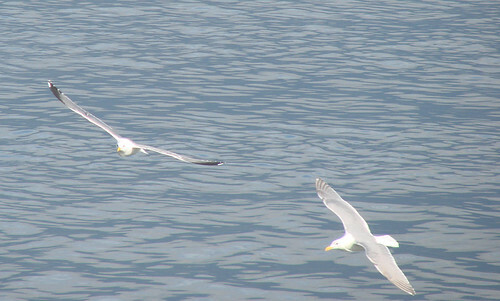 More gulls tomorrow, I hope!